A couple of weeks ago, I surveyed my audience, to help me better understand what their business interests were and what they felt was keeping them from succeeding. Today, I'd like to share those survey results with you. In total, I received about 400 responses. Going through all the responses, I was definitely able to spot a few trends and areas that people are most concerned about. So, first I'd like to share the survey results with you. Then I'll share a bit more about my plan to address the issues people brought up in the survey. Question 1: What online business are you most interested in learning more about? As you can see, nearly 72% of those polled are interested in learning more about Building Websites (niche or authority websites). Wow, that's pretty overwhelming! Only 11.7% are interested in hearing more about Amazon FBA, and 12.5% want to hear more about eCommerce. The results speak pretty loud and clear, the overwhelming majority of you want to hear more about building niche or authority websites. Message received. Question 2: What is your biggest fear or frustration when it comes to starting or growing an online business? This question was simply a text field that people could fill out with their own answers. The screenshot above is just a random sampling of the types of answers received. In general, people's biggest fear or frustration was finding time to work on projects, putting lots of effort into something to only see it fail, knowing if you are on the right track, and going into the wrong niche. 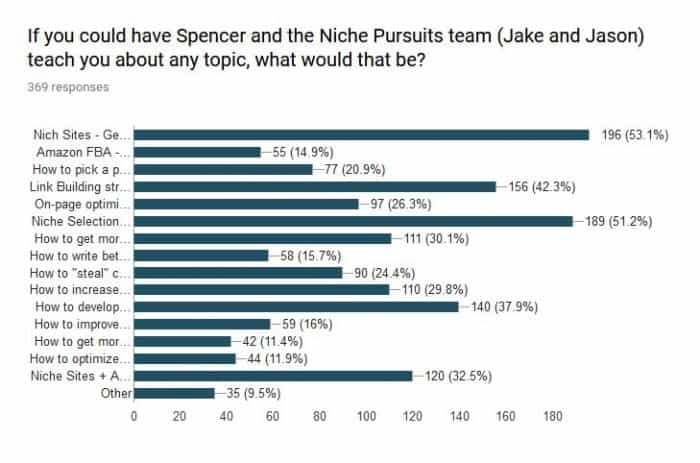 Question 3: If you could have Spencer and the Niche Pursuits team (Jake and Jason) teach you about any topic, what would that be? So, clearly people are interested in learning more about niche sites, keyword research, link building, and content strategies. 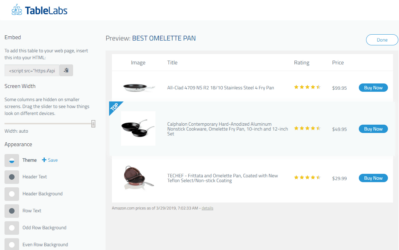 People are also interested in learning how to launch a physical product from their niche sites using Amazon FBA. I definitely have experience doing that. 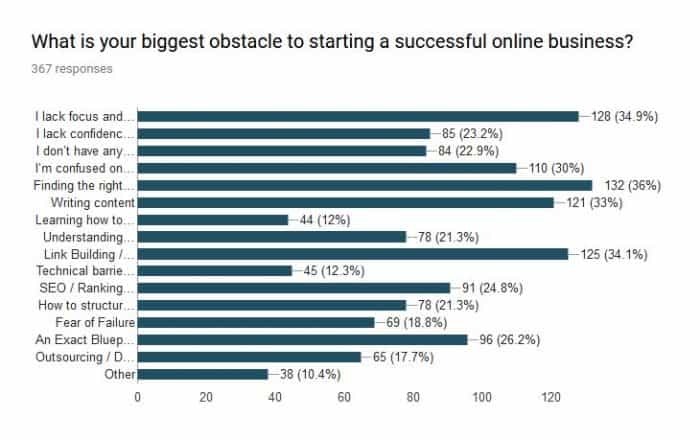 Question 4: What is your biggest obstacle to starting a successful online business? So, these responses are quite eye opening to me. Many people feel like there are some basic knowledge gaps that are preventing them from succeeding. They are struggling to find keywords, link building and outreach is a concern, and they don't know how produce good content. However, I think the second most popular response is quite telling and perhaps the most honest answer for many people: “I lack focus and leave many projects unfinished”. After all, many of the other “knowledge” based concerns can be overcome with time. You will never know everything from day one, you can learn a little bit each week as you consistently put forth effort. So, I do feel like focus is a big obstacle for many people and is something that needs to be worked on. After all, if you focused on building just 1 website for an entire year or more, I'm confident you would learn everything you needed and start to see success. Question 5: What is your ideal, perfect outcome (and how do you think you’ll get it)? This was an open ended question, with just a text field. So, the screenshot above is just a sample of the responses received. However, in general, people really want to make enough money to replace their day job, and they want to do that through their own website. The answers for how people will achieve this outcome typically revolved around: putting in more time and effort, focusing on niche sites, more education or training, and just working harder overall. More information/education related to building niche sites, keyword research, link building, and content creation. I don't know if I can provide all of these things directly. However, I do feel like I can provide the education and information needed. I can't directly wave a wand and make you more focused and committed to a project; however, I have some ideas to help. And then of course; hopefully the outcome of the right knowledge and the right focus and commitment will be a decent income. My immediate plans to provide better education and perhaps some motivation is through a live training workshop this Thursday (May 25th) at 6pm PST / 9pm EST. 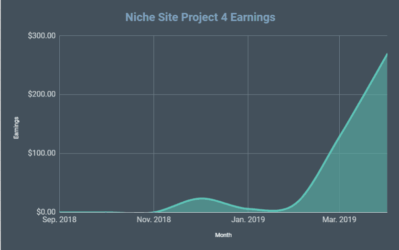 I'm preparing a presentation that shows the exact steps I've used to build successful niche websites that have achieved the results you can see on my last income report here. 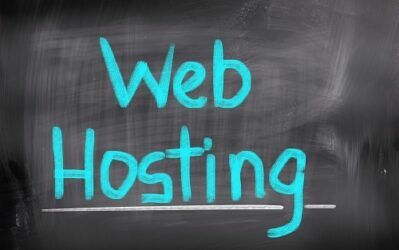 This will be an strategy session of the entire process from start to finish for building a successful niche website. I'm hopeful that this step by step process will help make it clear what is involved in the entire process, so you can feel confident moving forward. In addition, on the webinar with Jake, Jason, and I (the Niche Pursuits Team), you will have the opportunity to ask your questions. Live Q&A is always fun, and will hopefully allow you to walk away with a clear plan. Also, during the webinar I will bring up something new that is part of my plan to give you the blueprints that you need and the additional support and motivation that you might find helpful in your online journey. So, hopefully you'll join me on the webinar to see what the latest updates and plans are for Niche Pursuits. Register for the Niche Site Live Training Here. Overall, if you have any additional thoughts or questions, please leave those in the comments below. What do you think of the survey results? 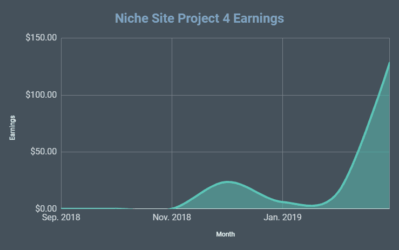 Building Base Links for Niche Websites: Niche Site Project Week 9! I would really love to see more in-depth keyword research personally using other programs outside of LTP such as Market Samurai or alternative free methods that actually do provide real results without requiring ridiculous sign-up fees. As an FBA seller I’ve enjoyed some of your FBA stuff overall but personally, I look forward to the articles where you share success stories of other Niche Site builders and when you deep dive into what they did to achieve their success like you did with Nick a couple of weeks back. On a side note: Please keep transcribing those podcasts! It allows me to read them in chunks at my day job. Just my 02. cents though. I like to see a NichePursuits Challenge focussed on adding a forum to an existing niche site. I’ve had reasonable success with a forum in the past. I didn’t get many good user registrations. But the lurkers went click crazy and I got some good income from CPA offers linked to with inline links. P.S. 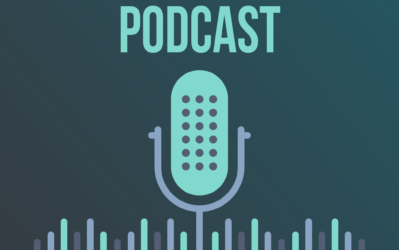 I’d also love to see the podcasts continue to be transcribed… I also read them during my day job!!! Interesting. Thanks for the feedback Brett! I’ve always found with myself and with friends that procrastination is the biggest success killer! Been following your site for years. I really think helping people make their first $1 online would be a good step. Then getting them to make $20/month consistently and then $100/month consistently. Most people cannot conceive or fathom making $5,000 plus a month. But building up to $1,000 – $3,000 a month would be life altering for some and at least show the potential for others. Your inside community sounds very tempting. But is the support going to be there from you guys? I agree, the ball needs to start rolling at some point. Yes, we are all personally very active in the group. We are supporting and proactively posting in the Insider group each day. I think money plays a large role here, if you’re short on it it’s hard to convince yourself to invest in one or more sites as for many it feels like dumping money in a blackhole and no certainty they ever make something back. Many have been burned before as well, either by dodgy service providers or Google updates which doesn’t motivate either. A lot of procastrination may be the result of those subconcious fears. I even realeased a book on my journy and a bit of a guide inside explaining how I actually ranked my sites. If you care to read it (around 40-50 pages only) i will send it to you for free. I own you so much. Thanks Pau! Do you mind if I use this as a testimonial? 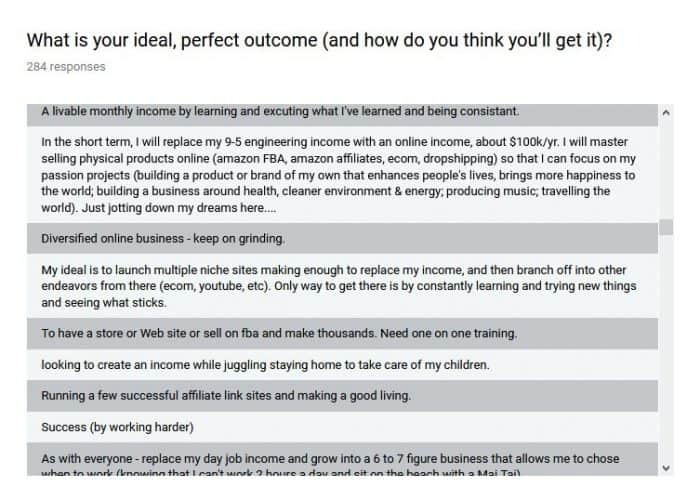 Hey Spencer, thanks for sharing survey results.The biggest issue for me is procrastination and the right mindset.If you can create detail post or even course about how you make perfect internet entrepreneur mindset, it will be a great help for all internet marketing community.